LORRAINE KROFCHOK lives in Elk Grove, California. She is the director of Grandmothers for Peace International, an organization founded in 1982 at the height of the Cold War. The group was founded by Barbara Wiedner of Sacramento, who lived fifteen minutes from Mather Air Force Base. She became aware of 150 nuclear weapons at the base, aimed at the Soviet Union, and made her think that if things did not change, her grandchildren could be part of the last generation on earth. "That thought catapulted me 'out of my kitchen,' to join others at the gates of Mather in protest of the nuclear arms race. My granddaughter made me a sign that read 'Grandmother for Peace,' which I held at weekly protests. That sign attracted a great deal of attention from the public and media." When Barbara learned she was terminally ill she asked Lorraine Krofchok to continue Grandmothers for Peace. Lorraine was not a grandmother, but Barbara knew that and said biology was never a requirement. Lorraine says she did not "take over, but is taking care of a beloved organization." There is no requirement for membership because "grandmother" is a concept of love and caring--there is no age, biology, or gender required! NAD: Lorraine, hello, thank you for taking the time for this. 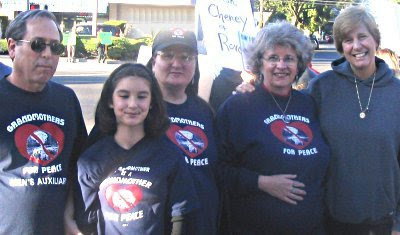 How long have you been with Grandmothers for Peace? How did you get the director's job? I joined GFP in 1990, well before the age of the possibility of being a grandmother because I liked the concept and the people in the organization. I became director when Barbara found out she was terminally ill and she asked me to continue. Actually, she saw a video of an interview at the SOA protest at Ft. Benning and knew I could do the job. But, we were friends from the beginning of my association in GFP since 1990. NAD: Doesn't that keep you very busy? It keeps me very busy and it could consume my life if I let it. I like to have "my other life" though--and that is a love for music and the theater. NAD: Why do you think that your group has such broad appeal? "Grandmother" is a feeling of love and caring. We have a broad appeal because people can do as much as they want, but can also be a part of GFP in any way they want — making phone calls, writing letters, standing on corners with a sign, active in the political process or, as one woman wrote me "It is SO good to be able to write a letter and sign it "Member of Grandmothers for Peace! Bush didn't "directly" knock down the towers, but he did ignore the August memo. I think his handlers had a "buzz" that something was going to happen and "let it go" because Bush was already falling out of favor. However, they had no idea how BIG the event would be. I think they believed it would be a "terrorist" attack of some sort, a shopping center, school, activity, but nothing on the scale of the WTC. It became the "opportunity" to promote the agenda of the neocons--the event they were waiting for. The Bush years were survived by the activism I did, along with the help and dedication of Grandmothers for Peace and the solidarity groups all over the world. I don't hope for something better from Obama, I expect it. He has a huge job and I don't expect instant change, but I want to see the steps to peace and undoing the disasters of the Bush years. NAD: What do you think about the election of Obama? It was an amazing experience to be part of history. Fifty years ago a Black man could not go in the same door as a White person, nor drink out of the same water fountain. It made me so proud that so many saw beyond and it was a goose bump moment in time to see how the rest of the world reacted. I literally could feel the world breath a sigh of relief at one second after 8 p.m. Pacific time when the projection for Washington, Oregon, California came in and it was announced "Barack Obama is the 44th President of the US." I was absolutely hysterical with joy and hope — and knowing it was the end of an error. Obama will not do everything for all, but we can only proceed with steps — and that usually means two steps forward and one step back. It is a difficult path, but at least we can be finished with the stumbling, destructive path of the Bush years. I really don't like past history. I have lived in many places. Grew up in New Jersey, lived at Lake Tahoe, Southern CA, Northern CA, Phoenix, Atlanta and now in Sacramento. What I would like to do, or see is some kind of peace come to this country and a sense of living without intense militarism. Oh, dear, I don't have long term goals anymore — just live a few days ahead — plan for a few months! BUT, I hope to make plans to go to the big party and Fiesta at Ft. Benning when we hope the SOA will finally be closed! NAD: Have you been arrested? Been in jail? NAD: How has your activism been accepted by your family, friends? There is not much choice. I do it. They accept it or not. I try to stay focused on what is asked! Grandmothers for Peace International, working for peace since 1982 and everyone is welcome! Doing what I am doing, but would love to be cooking on TV!